Julie Crick, Jodi Schulz and Holly Tiret traveled to Washington, D.C., the second week of July, to visit with legislators and staff of national agencies and to attend the National Extension Leadership Development (NELD) North Central Region session. Julie, Jodi and Holly shared their Michigan State University (MSU) Extension stories with Reps. Dan Kildee and John Moolenaar, as well as with staff members of Rep. Justin Amash, Sen. Debbie Stabenow and Sen. Gary Peters. Holly Tiret, Jodi Schulz and Julie Crick met with Rep. Dan Kildee. Photo courtesy of Rep. Kildee’s office. Julie is an MSU Extension educator who specializes in leadership and educational programming expertise in natural resources with a focus on forest stewardship. Jodi serves statewide in areas of youth development and is a 4-H educator. Holly is an Extension educator who focuses on social-emotional health and well-being across the life span. “We were able to speak about how our own personal passions transfer into the work we do in our areas of specialization and ultimately make an impact on those we program with in communities,” Jodi said. Julie, Jodi and Holly shared that they felt prepared and empowered by MSU Extension’s encouragement to make strategic connections and because of the Expect to Connect materials on the Organizational Development Team website. “Many thanks to everyone who worked on those!” Julie said. During their time in Washington, D.C., they also visited with agencies such as the United States Department of Agriculture, the National Farmers Union, the Embassy of Tribal Nations and the Immigration Policy Center. NELD is a professional development opportunity to strengthen leadership and effectiveness of Extension staff members. Each year, Extension administrators across the country are asked to identify emerging leaders who are working on a critical issue or will be assigned one in the future. These individuals are nominated to participate in the NELD North Central professional development opportunity. NELD hosts four sessions a year. The session in Washington, D.C., focused on leading in a shared-power world. Holly said that the team took away significant information on themes of leadership from this conference such as the importance of relationship building, believing in yourself and public service, and inspiring your team. Tagged as dan kildee, debbie stabenow, expect to connect, gary peters, holly tiret, jodi schulz, john moolenaar, julie cirkc, justin amash, michigan state, michigan state university, msu, msu extension, msue, national leadership development, neld, neld north central region, strategic connections, washington d.c.
Congratulations to our 2016 Michigan Association of Extension 4-H Youth Staff (MAE4-HYS) award winners! These awards were announced and received at the 2016 Children and Youth Institute (CYI) Retreat. In 2015, Michigan State University (MSU) Extension served 182,000 youth. The people mentioned below are just a handful of those making a difference in young people’s lives. The awards are a testament to the important work that our CYI colleagues are doing across the state. Makena Schultz, MSU Extension leadership and civic engagement educator, received the Achievement Award. This award recognizes new 4-H staff members who have demonstrated excellence in the development and organization of their county 4-H Youth Development Programs. Makena received the award for her coordination of 4-H Capitol Experience, programs in reflections and failure resiliency, her lessons on teen facilitation, group decision-making, youth-adult partnerships, communications and conflict resolution as well as her development of new partnerships, and her collaboration in creating the World Food Prize Michigan Youth Institute. Melissa Elischer, MSU Extension dairy youth educator, received the Presidential Citation. The award recognizes staff members for a specific program, topic or activity. Melissa works with MSU faculty and MSU Extension staff members, 4-H volunteers and stakeholders to develop, implement and evaluate statewide programs that provide opportunities for youth to develop content knowledge and life skill development. Additionally, her work brings together MSU faculty from the College of Veterinary Medicine and the College of Agriculture and Natural Resources’ Department of Animal Science, local volunteers and industry partners to bring growth and renewed energy to 4-H dairy events. Through her programs, bookmarks and dairy guide, she has been able to introduce and teach animal care and well-being to youth and adults across the state. Melissa also received the Scholarship for Personal and Professional Development, which she can use to travel in the U.S. or abroad to study youth work or use toward graduate tuition to facilitate growth in her Extension work. Kristi Ayers, MSU Extension 4-H program coordinator based in Kent County, received the Diversity Award, which recognizes staff for outstanding effort and accomplishments in achieving and sustaining diversity in county and state 4-H youth work. Kristi has formed key partnerships with community agencies and schools serving youth in Grand Rapids. Through these partnerships, she has offered programs in Spanish as well as food and nutrition education in urban food desserts. She has supplied blankets and books to people who needed them. Through the 4-H embryology project, she has taught young people about the beginning of life. Kathy Fischer and Dana Wawrzyniec won the Team Award. Based in Calhoun County, Kathy is a 4-H program coordinator, and Dana is a health and nutrition program instructor. Together, they worked with the local nonprofit Sprout Urban Farms to teach Calhoun County residents how to eat healthier. They developed a community space with a tool lending library, visited classrooms to teach about plant gardens and eating fresh fruits and vegetables, and formed a partnership with the food service director. After learning about plants in the classroom, students were excited to see fresh produce as part of the lunch choice. Kathy also received the First Time Conference Scholarship to attend the National Association of Extension 4-H Agents. 1) Agro-Culture Liquid Fertilizer has supported the Clinton County 4-H Livestock sale for over 30 years. Troy Bancroft, his family and the company staff have a huge impact on the Clinton County 4-H and Youth Fair as financial supporters and sponsors and as volunteers, lending their time and resources. They also provide a space for board meetings, awards ceremonies and other events. The partnership between 4-H and Agro-Culture has been invaluable. 2) Fifth Third Michigan State Fair LLC and Suburban Collection Showplace benefits 4-H and our youth in many ways. It gives 4-H’ers an opportunity to showcase 4-H projects, learn life skills, and apply for and receive scholarships for their achievements. The junior fair board provides leadership development. The future opportunities are infinite, creating a mutually beneficial relationship with a fantastic opportunity to highlight the services of MSU Extension. 3) Michigan Milk Producers Association (MMPA) has been a longtime supporter of youth programming in Michigan. For more than 80 years, MMPA has partnered with MSU Extension to enhance and grow 4-H programming in dairy science and other animal science project areas. Contributions to the program have been extensive. They include annual funding through the 4-H Foundation, grant matches, start-up funds with continued support for a 4-H camp, personnel to assist at statewide dairy youth events, and the hosting of an annual youth career development and scholarship program at the Novi headquarters. Ken Nobis, Joe Diglio and Sheila Burkhardt, attending on behalf of MMPA, were honored during the program. Tom Guthrie and Nicole Wethington each won the Colleague Award, which recognizes an individual within MSU Extension who has made an outstanding contribution to MSU Extension 4-H Youth Development. Tom is a statewide Extension educator based in Jackson County. In 2015, Tom was a superhero who helped Jackson County overcome a health outbreak leading to a short quarantine of the barn at the fair. Tom helped in monitoring pig health, calling in experts, and communicating with superintendents and families, and staff worked as a team to minimize the impact to the fair, exhibitors and buyers. Nicole is an MSU Supplemental Nutrition Assistance Program‒Education (SNAP-Ed) program instructor in Crawford and Roscommon counties. She has taught 4-H day campers about germs and physical activity, trained aspiring chefs about food safety and the source of our food, and shared exotic fruits and vegetables. She has also trained staff and volunteers to deliver lessons on healthy choices. Helen-Ann Cordes, a 4-H program coordinator in Alpena County, received the Communicator Award, which recognizes significant accomplishment in presenting 4-H to the general public, civic groups, 4-H groups or individuals through public information methods. Her use of technology, print and social media to educate and communicate with members, their families and volunteers has allowed her to reach people where they are. Video recorded trainings and updates for leaders also minimize the number of after-hours meetings necessary. Helen-Ann also uses these media to market 4-H to residents of Alpena County and certain programming to surrounding counties. Julie Thelen received the MAE4-HYS Excellence in Camping Award, the National Excellence in Camping Award, the MAE4-HYS Programming Expertise Award in Animal Science and the National Excellence in Animal Science Programming Award. Julie is an MSU Extension 4-H livestock and veterinary science educator who develops, implements and evaluates statewide programs for youth. She received both the MAE4-HYS and National Excellence in Camping awards for her work expanding the livestock and veterinary science programs by introducing the 4-H Animal and Veterinary Science Camp. Julie received both state and national programming awards in animal science because of her focus on curriculum development, specifically bringing zoonotic disease education to the forefront of animal science and her development of 4-H club biosecurity and zoonotic lesson kits. Glenda Weiss received the Urban Programming Award for partnering with local schools to offer science, technology, engineering and math (STEM) education. She designed science activities shared at urban events and developed community center partnerships to hold craft events. She also partnered with Pingree Farms to provide youth with transportation to their farm where they learned about caring for farm animals. Jodi Schulz, an MSU Extension educator focusing in capacity building and academic success, received the Michigan Distinguished Service Award, which recognizes an individual’s career in 4-H. She is a model example of a 4-H staff member, a CYI educator and an MSU employee and has been over her 10-year career. Highlights of her contributions include the Life Skills Wheel, the creation of Michigan 4-H SPIN Clubs and her productive partnership with Bay City Public Schools. The National Distinguished Service Award is one of the highest honors given at the national level. Staff must have 7 years of experience and have won the Michigan Distinguished Service Award to be eligible. This year, Betty Jo Krosnicki, MSU Extension educator in career education and workforce preparation, and Janelle Stewart, MSU Extension children and youth educator, received this prestigious award. Over the past 10 years, Betty Jo served in a number of capacities during her tenure as an MSU Extension educator, including county coordination, the Volunteerism Area of Expertise Team and workgroup roles on the Academic Success, Life Skills, and Career Education and Workforce Preparation teams. Janelle coordinates for Lenawee County, works on the Leadership/Civic Engagement work team, serves on the Advisory Resource Team and is a member on the Capitol Experience Steering Committee, the State Youth Leadership Council Advisory Committee and the Spectacular Steering Committee. She teaches classes in the leadership, citizenship, global education categories such as Youth/Adult Partnerships, Officer Training, Communication, Conflict Resolution, Teen Facilitation, Leadership, Running Effective Meetings and much more. Bev Przystas received the National Meritorious Award, which recognizes professional attitude, professional improvement, professional accomplishments, personal attitudes, interests, community involvement and special honors received. Recipients must have more than 15 years of service. Bev has been the 4-H program assistant for Gladwin County for 37 years. Her passion for 4-H youth development has reached many youth, volunteers, her community and peers. Her ability to listen and to work with others has helped to bring positive outcomes to potentially negative situations. In her many accomplishments, she has shown teamwork, compassion and integrity. Jan Brinn, an MSU Extension educator specializing in academic success, leadership, civic engagement and global and cultural education, received the National Excellence in Global Citizenship Award. The award recognizes those who strive to develop and/or conduct programs and/or projects that provide opportunities for youth to develop a world-view including a global perspective and the skills necessary for global citizenship and the development of appreciation for living in a global society. Jan’s work with the Michigan’s 4-H China Project has been positively influencing youth for over 25 years. More than 350,000 youth have participated in the Michigan 4-H China Project global citizenship programs in a variety of settings. Through the Art Exchange, Michigan children in grades K‒6, communicate and learn about China through creating visual letters to send to children in China. The Rocky Award celebrates the moments when staff do something extraordinary. This year, the award was given to the group that attended the 4-H National Conference in Portland, Oregon: Jan Brinn, Sarah McKinney, Matt Newman, Roxanne Turner and Nancy Victorson. They received the award based on their successful and thorough exploration of Mount Hood. Please join me in congratulating our MSU Extension colleagues for their work and their award recognition. For the past few years, the Molina Foundation and Michigan State University Extension have been working to place books in the hands of children living in low-income situations and enhance literacy levels of Michigan’s children. Since 2011, the Molina Foundation has donated and MSU Extension has distributed about 250,000 books to Michigan children. This past summer, MSU Extension educators and program coordinators received 30,000 new children’s books to give to Michigan children. They handed out the books at community events, elementary school open houses, Project FRESH, outreach programs for children in migrant camps, county fairs, Operation: Military Kids events, summer camps and more, reaching thousands of children with the gift of free books. This type of program gives children access to age-appropriate books that they otherwise may not have had. MSU Extension staff members who provided leadership for this effort include Jodi Schulz, Bay County educator; Jodi Wrzesinski, Bay County 4-H program coordinator; Theresa Silm, Clinton County educator; and Carrie Shrier, Livingston County educator. The Molina Foundation received a key partner award at Fall Extension Conference this year for its continued work with MSU Extension and dedication to improving literacy in Michigan. Several Michigan State University Extension staff members shared their knowledge and expertise with the national 4-H community at the National Association of Extension 4-H Agents (NAE4-HA) Conference held October 26‒30 in Minneapolis, Minnesota. This was a great opportunity for MSU Extension to expand our reach to a nationwide audience of our peers. Deb Barrett, Frank Cox and Janice Zerbe presented on the Career Exploration and Workforce Preparation work group’s National 4-H curriculum “Build Your Future: Choices… Connections… Careers.” Health and nutrition experts Janet Olsen and Karen Pace presented “Be SAFE” – to help addressing bullying in 4-H and other out-of-school settings. Judy Ratkos and Jennifer Weichel joined a panel conversation on using data to creatively make the case for 4-H, and Kendra Moyses, Betty Jo Nash and Jodi Schulz presented “Back to the Basics” – life skills curriculum packages to help 4-H leaders increase their impact. Three staff members, Christine Heverly, Glenda Kilpatrick and Janice Zerbe, were also recognized at the event for their service to Michigan 4-H.
Sunday night’s storm left many of us without power. An article Michigan State University Extension educator Lisa Treiber wrote back in April contains advice still relevant today. “Don’t Open the Freezer When the Power Is Out” gives helpful information to help you decide whether you need to discard that food or not. It also gives tips on being better prepared the next time the power goes out. The United States Department of Agriculture Food Safety and Inspection Service put out the guide A Consumer’s Guide to Food Safety: Severe Storms and Hurricanes. Page 3 has some helpful advice about what’s safe to eat in your refrigerator after a power outage. Check out the tables on pages 8 through 11 for a list of common foods – what you can save and what you shouldn’t save after the power goes out. Another MSU Extension article “Planning and Preparing for a Power Outage” by MSU Extension educator Jodi Schulz gives resources to help prepare for a power outage and ideas to keep your children busy until the power comes back on. I know that some of you have heard you will be without power until Saturday so I know these ideas may come in handy. It’s evident when you listen to news reports, scan social media or just talk to folks – issues related to bullying, bias and harassment concern parents, educators, family workers and others who work with and care about young people. And, of course, these issues concern young people as well. Schools have resources to address these issues, but few address bullying issues in out-of-school settings. As always in Michigan State University Extension, our staff members see a need and work to meet it. That’s why MSU Extension Health and Nutrition program leaders for social and emotional health Janet Olsen and Karen Pace created Be SAFE: Safe, Affirming and Fair Environments. The two targeted the curriculum for use in out-of-school settings such as 4-H clubs, Boys and Girls Clubs, scouts and after-school programs. Be SAFE helps young people aged 11 to 14 partner with adults to create physically and emotionally safe environments. The overall goals of Be SAFE include promoting social and emotional learning and development, addressing and reducing bullying, preventing bullying behaviors by tapping the wisdom and assets of youth and adults, and developing positive relationships with peers and adults. Research shows that young people benefit from time spent in positive and safe settings with adults and peers. Adults can use Be SAFE as an important tool to help young people to create those safe, affirming and fair environments. The resource helps adults to help young people be resilient when facing challenging situations such as bullying, bias and harassment. As true of all MSU Extension curricula, this publication draws from extensive research, and Karen and Janet also drew from evidence-based bullying prevention programs. A number of their MSU Extension colleagues also contributed to the development of Be SAFE by serving as reviewers and as liaisons to the nine sites across the state that piloted the material. These included staff members from the Health and Nutrition Institute (Tracie Abram, Denise Aungst, Carolyn Penniman, Suzanne Pish, Erin Ross, Olga Santiago and Holly Tiret), the Children and Youth Institute (Kendra Moyses and Jodi Schulz), and the Organizational Development Team (Dionardo Pizaña). Former Children and Youth Institute staff members Andrea Caron, Sandra Griffin and Julie Scislowicz were also involved with these efforts. Janet and Karen are currently working to assist MSU Extension staff members in providing education around issues of bullying, bias and harassment. It’s not too late to register for a June 4 train-the-trainer opportunity in Gaylord. 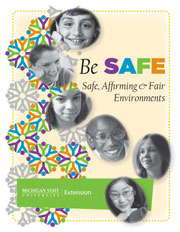 You’ll receive a copy of Be SAFE and learn how to incorporate the curriculum into your program. You’ll also explore current research on bullying and learn key strategies to address bullying issues. Click on this link to learn more and to register. Download a free PDF of the Introduction section of Be SAFE or order a copy of the 224-page guide, designed and edited by ANR Communications, at the MSU Extension Bookstore.